I hope you all had a great Easter. 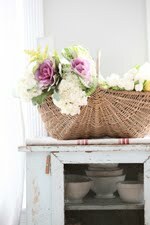 I wanted to share a few pictures I took of a vintage french fruit crate for my online shop. Sorry for the repeat of product pictures using lilacs, but that is what I had at the moment, and used them for about every product picture I took that weekend. I just wanted to share an idea of how you can add some french farmhouse life to a dining room table. 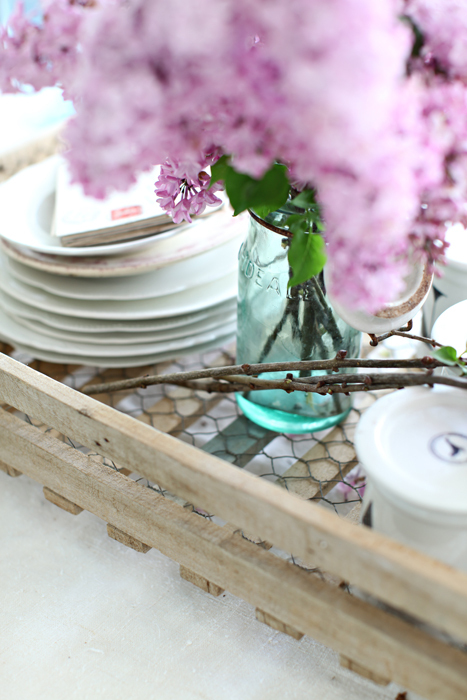 I decided to show a way to use the crate housing dishes in a more decorative way on my dining room table... I tried to keep a french farmhouse feel in the process. I like how the Anthropologie monogrammed mugs look against the chicken wire and wood. Have you been to the Remnants of the Past Vintage Show? 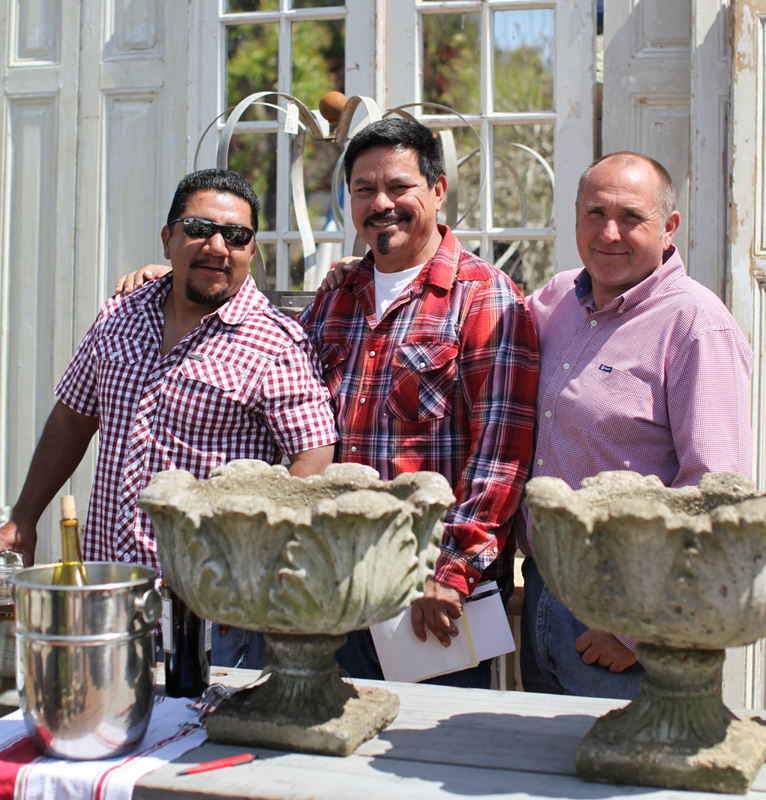 The show is this Saturday, April 30th, from 9 a.m. to 4 p.m.
you can read more about the show by clicking here..
Will you be going to the show??? Maria- Those lilacs are too dreamy! The classic shape and color are perfect with the elements on the table. p.s. Added your blog to my Favorite Blogs sidebar. You are an amazing writer and photographer! Lilac always looks lovely and smells divine. 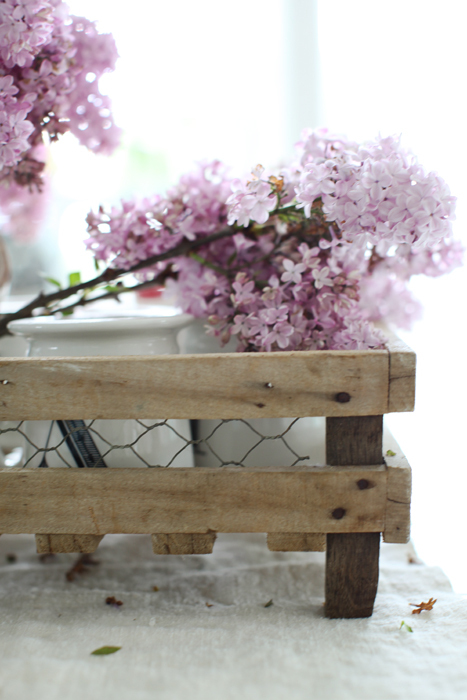 So pretty against the rustic vintage crate. I would love to go to that show. You have some pretty wonderful things over there. We do here too, but I can never help but feel a twinge of envy when I hear about these things. I keep hearing bits an pieces about the amazing vendors at the show. I am so sad that I live on the other side of the Country!! For me, lilac can be everywhere and always. I love this. :) Beautiful photos! your composition is so beautiful again. I love lilacs and thus love watching your fantastic pictures. The idea to use chicken wire in the crate is so lovely, I'll borrow it. And the mugs are something I'll definitely look for. Love the Lilac!!! You could use it all the time..lol The crate looks very pretty!! Have a Great Day !! love the flower! what is it ? Love those fruit crates, have never seen them before. One can be so creative with them. 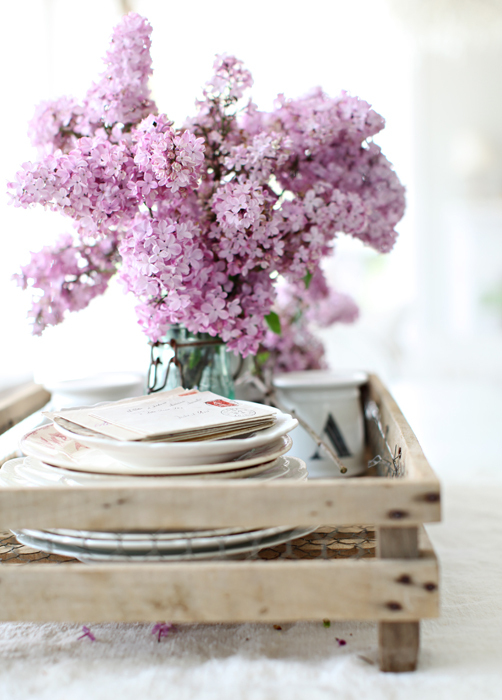 Gorgeous post, and love the lilacs!! The table setting looks just lovely. Thank you for sharing your sweet ideas. After reading the book RPS and observing all pics I can definitely tell this is not only a life style there's a lot about loving what you do and making it pretty to those you love too. Thanks for a great inspiration! maria...the lilacs are lovely and your ideas are inspirational (love the letters - makes me want to write one to someone today). thank you. -k.
That looks so pretty! There can never be too many photos of lilacs...I only wish I could smell them! 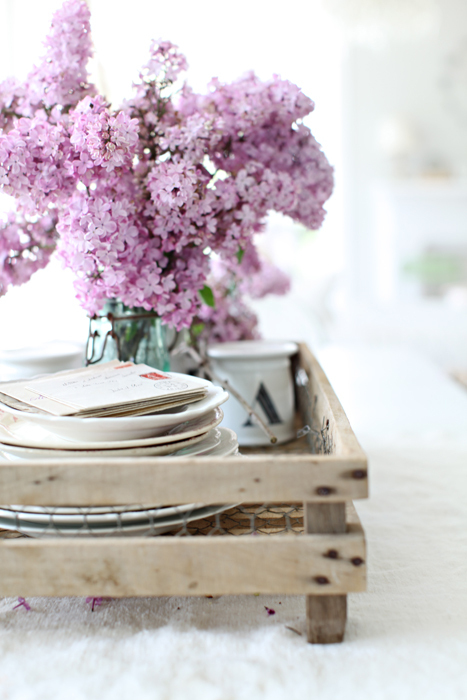 Those lilacs are just gorgeous and oh I love that rack!! You always have such great pictures. I also wanted to let you know that I have hit a milestone on my blog and am having an all natural organic giveaway and I would love for you to enter! I thoroughly enjoyed getting inspiration from Atelier de Campagne when you posted about that sale...wow...what a wonderful store! Jason is building things similar to that drying rack for the sale here...I hope they do well!! Oh Dang! I was just in Nipomo LAST weekend! :( I guess I'll be missing it too. I can almost smell the lilacs through the screen, I can never get enough of your pictures! SO dreamy and pretty! Absolutely Gorgeous! You are very talented! What a wonderful way to dry your dishes. I love it! I've been perusing all of your gorgeous home photos. I could never get tired of those lovely lilacs. I guess I will be the only one so far on your blog going to Judy's show. I have been to the past 4 and they are all amazing! Altho I think the addition of the new vendors is going the be the best show yet!! I will let you know :) We are scheduled for perfect spring weather too (FINALLY!). Maria, I Love your blog and I look forward to reading each post. Your photography is very inspiring. Hi Maria! I want you to know how much I truly appreciate you and your blog and your continuing effort to help us "decor-deficient" gals out here who swoon over your talent! :) I just adore the way you style, and soak up every photo and piece of advice you offer up. You help me to think outside the box - and the answer always lies in "sweet simplicity". Love ya, girlie! 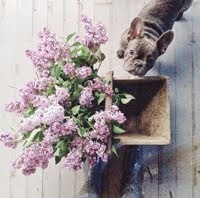 I love the lilac and I love your pictures!!! Decor 8 sent me your way today! Boy am I grateful!!! Great store! Just stunning blog my first time here! I could say here for hours! I am hooked and will be back often! I saw a rack like that a few weeks ago. I wondered and liked it but the price... Oooo La la!!! to high for me to think about but I might have to attempt a knock off..yours is beautiful! You've created a beautiful centerpiece ~ so lovely and welcoming! 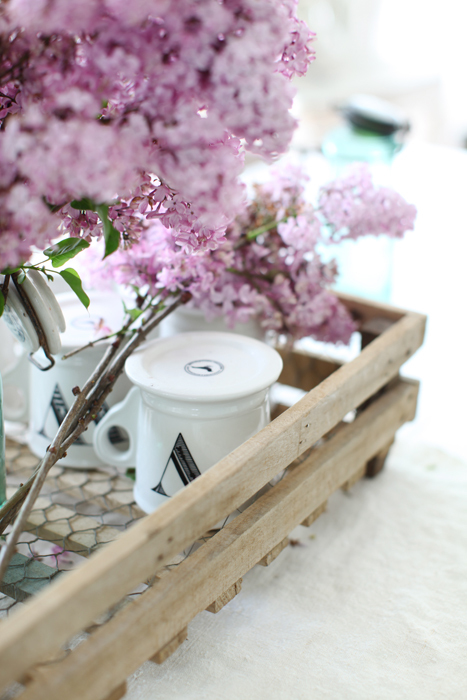 i wanted to let you know that you totally inspired my easter table setting! thanks for being so inspirational. i talk about you and your great style to my husband all the time, i think he's getting tired of hearing about how great i think your style is! i posted pictures, i would love for you to check it out. Hey, congrats on being featured on Decor8. 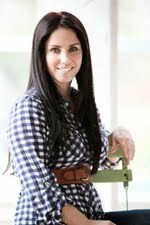 I love your style and blog, it's very inviting, clean and fresh. I wish you great success with your new online store, which I will check out... now! What a great idea. I would have never thought about using the crate as a dish drying rack. Adore the look you showcased. My lilacs are just beginning to bud! Pretty pics. 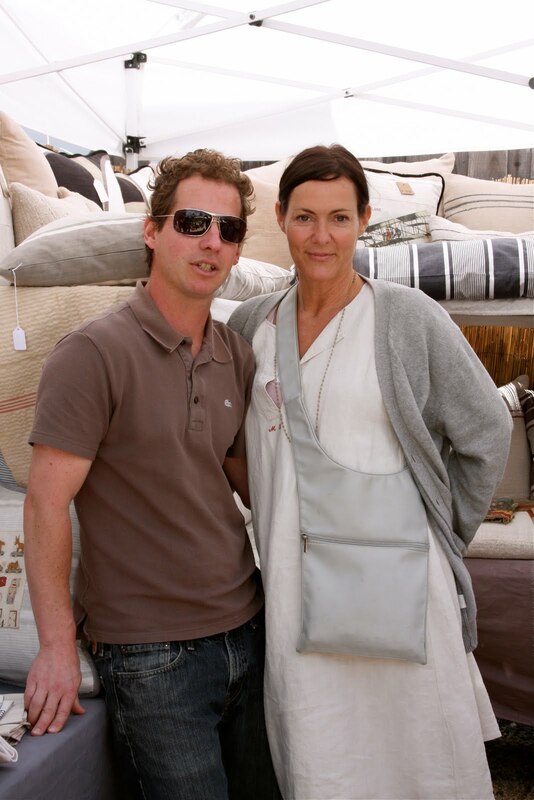 I bought a great piece of gray and white ticking from Dani and Eric last year. Their booth and wares are the best! Hola Maria! What do you mean you can't come? There will be so many subjects and adorable vignettes for your camera to capture. Tell your nice cowboy beau of yours to saddle up the horse and bring you. I wish I could go too. Maybe next year...loving your lilacs BTW. 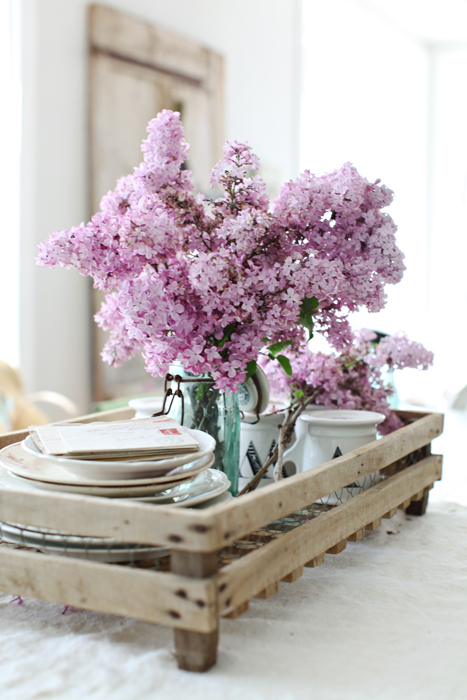 Can one ever have too many photos of lilacs? I think not. LOVE the French fruit crate!! Your site is so inspiring! I would love to paint everything white white white! Then add color here and there....ever thought about moving East? :) you are on my google feed and sidebar now! love it!! we will not have lilacs here in Michigan for at least a month and I can NOT WAIT! They smell so beautiful. Ad they look so wonderful all over the house! That crate is so cool! And to use it for a dish drainer, what a great idea! Love this crate and wish I could make it to the show...are there any dates for NYC?? Or, maybe it'll be part of the Javits Gift show??! 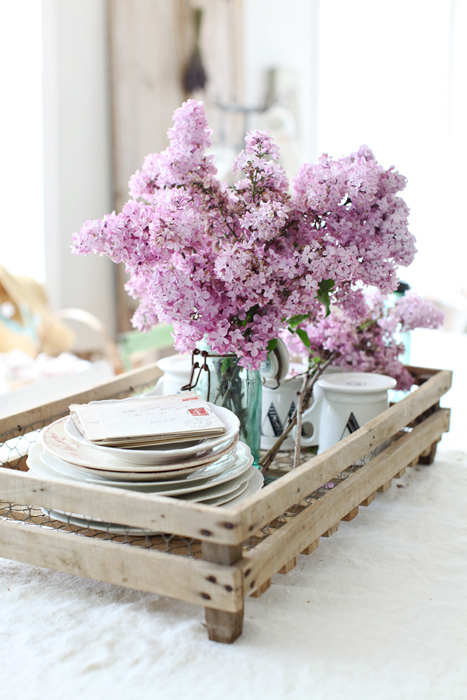 A absolutely ADORE lilacs and their sweet fragrance and they look so nice in the vintage crate! So many friends are going to be there and my sweet blogger buddy Susan from Blooming Rose Musings really wants to meet up there and here I am still deciding at the last minute! Hope all is well with you and your fine family!! Beautiful photos, Maria! Those lilacs are gorgeous. Hope you had a lovely Easter. What a gorgeous idea! I just came across your site, It's lovely! I am writing here because I was not able to send you a question from "email me". Would you please advise how I can contact you? Even this is the first time I am visiting this blog, I am proud to say that I am the great fan of you.. I've been browsing online more than 3 hours these days, yet I by no means discovered any attention-grabbing article like yours. It's beautiful value enough for me. In my opinion, if all web owners and bloggers made excellent content as you did, the internet might be much more helpful than ever before.